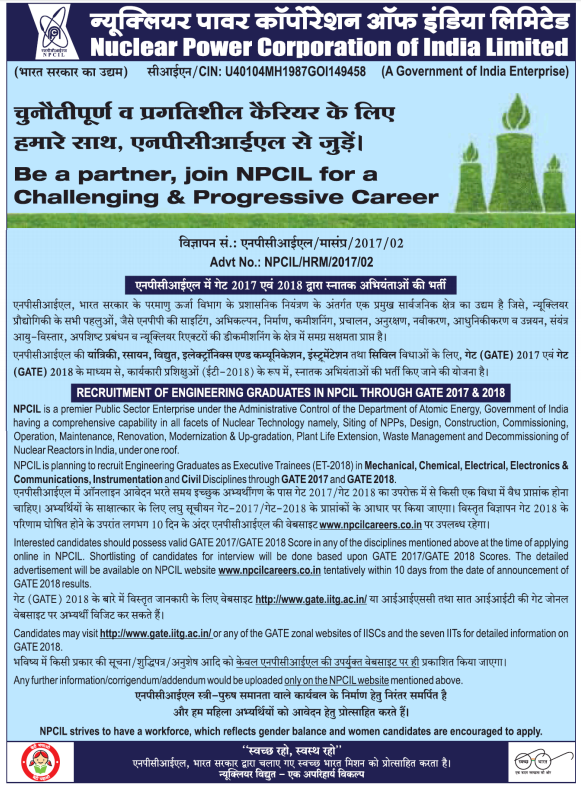 NPCIL Recruitment 2017 for the post of Executive Trainee for B.E/B.Tech graduates through GATE 2017/2018 & for the post of Stipendiary Trainees / Technician-‘B’.The detailed eligibility and application process are given in below. Rs. 7200/- for 2nd year. HSC (10+2) or ISC (with Science subjects) with not less than 50% marks in Science and Mathematics individually. Shall have English as one of the Subjects at least at SSC level Examination. SSC (10 years) with minimum 50% marks in Science subjects and Mathematics individually and 2 years ITI Certificate Course in Electrician/Instrument Mechanic/Electronic Mechanic/Fitter Trade. For trades for which the duration of the ITI course is less than 2 years, the candidates shall have at least one year relevant working experience after completion of the course. Shall have English as one of the subjects at least at SSC level Examination. Should be between 18 to 24 years as on 20.10.2017. Relaxable by 5 years in the case of SC and 3 years for OBC. Relaxable by 10 years in the case of PWD. Relaxable by 15 years for PWD with SC. Relaxable by 13 years for PWD with OBC. Minimum height – 160 cms and Minimum weight – 45.5 kgs (100 lbs). The above physical standards are relaxable by the Head of the Unit in highly deserving cases. The selection process will consist of test in 3 stages. (Stage 1 & 2 – Written Test and Stage 3 – Trade/Skill Test). There will be negative marking in the Written Examination for incorrect answers. Stage 1- Preliminary Test: Questions will be on Mathematics, Science and General Awareness. The qualification standard for Stage-1 shall be according to their category and cut off marks. Stage 2- Advance Test: Candidates clearing Preliminary Test (Stage-1) will be eligible for appearing in Advance Test (Questions will be from the respective trade) (Stage-2). The level of questions for Operator Trainees based on the syllabus in HSC or ISC. The qualification standard for Stage-2 shall be according to their category and cut off marks. Stage 3- Trade/Skill Test: Only for those candidates who have cleared the Stage-2 test and will be on go/no-go basis. However, there will not be any Skill Test for Category-II Operator Trainee for which the qualification prescribed is HSC/ISC. Candidates to undertake the Preliminary and Advance Test on the same day. Preliminary Test may be carried out in the morning session and the Advance Test for candidates screened in for Stage-2 to be carried out in the afternoon/evening session. This arrangements may be changed according to logistics arrangements. A merit list will be prepared based upon scores obtained in Stage-2 only. In the event of a tie, a standard sequence shall be followed for deciding position in merit list. No wait list shall be prepared. The Selection Committee decision is final. How to apply NPCIL Recruitment 2017? All interested and eligible candidates can apply for this position in online from 25 September 2017 to 20 October 2017. Applicants must have full Time BE/ B Tech/ 4 years B Sc (Engineering) / 5 years Integrated ME/M Tech with a minimum of 60% marks in any of the engineering disciplines from a recognized University/Deemed University or Institute recognized by AICTE/UGC. Only the above-mentioned disciplines will be considered. Courses/Disciplines with equivalence to the above will not be considered. Applicants must have a valid GATE 2017 score in the same engineering discipline as the qualifying degree discipline. Applicants whose final results are awaited and/or are appearing for the final year/semester examination during April – May 2018, but are otherwise eligible, may also apply. If selected, they will be required to submit the final result indicating completion of degree and percentage of marks (not less than 60%). The selection process is based on Verification of Original Documents, Personal Interview. Candidates obtaining valid GATE 2017/2018 score shall only be eligible for Personal Interview. The score is valid only if the candidate obtains more than or equal to the qualifying marks as fixed for the respective discipline in GATE 2017/GATE 2018. Only GATE 2017/2018 Score is valid for this post. GATE score of 2016 or of previous GATE examination shall not be entertained. All interested and eligible candidates can apply for this position in online latest through GATE 2017/2018.